Spring is always, well, spring like, but if you’re lucky each year brings something new and unexpected into your life. That certainly goes for us, as each spring season we get equally excited about putting fresh twists on old classics as well as unveiling new surprises. Here are some highlights of the Paul Fredrick Spring 2012 Collection. Winter looks good on you. There’s something about the rich fabrics, polished layers of style and festive holiday finery that makes a man look his best. From the dapper double-breasted suit and requisite fedora to the relaxed appeal of a country gentleman sport coat and corduroy trousers, we’ve got everything to keep you covered with a comprehensive collection for the modern gentleman who demands style, quality and value. This season red, purple and gold make an impressive showing and unique detail offers the wearer singularity, yet designs remain firmly rooted in the classics to ensure they’ll last for many winters to come. Knit Wit: From merino to pima, linen to silk, this is all about knits. Knits and wovens are two of those industry terms we in the clothing biz throw around. In common terms, what we’re talking about is pretty much sweaters and shirts, but not exclusively. 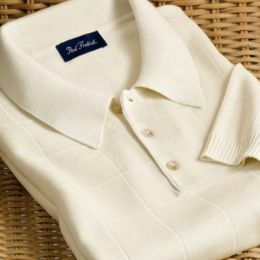 Knits, which refers to fabric produced by pulling threads up and through each other, are how many short-sleeved tops for warm weather, such as polo shirts, are made, in addition to your favorite chunky winter sweaters.